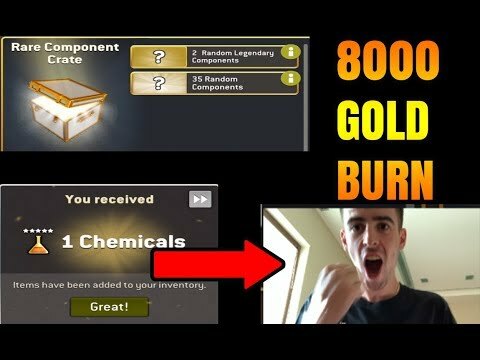 Burning 8000 Gold! INSANE Live Reaction on Rare Component Crate! @Pain_Walker are you happy with your results? After doing the math, this is what you SHOULD have expected to get and what you DID get (removing the 8 guaranteed legendary pieces). In reality, you gave up 1 legendary and 5 epics to get 6 rare pieces. You had below average numbers for the best 2 components rarities. I consider these results to be less than average. I opened 2 crates myself and you can see the results in another thread, but mine were not good either (less than average). Point is, it could end up being much worse right? And in order to get and "average, expected" outcome you'd have to open a 100 of those chests. With respect, the Expected Outcome can be calculated for any sample size. Yes, it's true that the larger the sample size, the more representative the samples will be of the population. But I see so many sub average crates, including my own 2 I purchase, that I'm wondering where the good ones are. His crates 1 and 3 were trash and his crate 4 was exactly average. His 3rd was very good for legendary, but lacking in epic...overall way above average on that one though. I guess one of my points is that the title of the thread is extremely misleading, especially to individuals that might be considering purchasing these crates. If sub average crate openings is "INSANE", then yes, it was rather insane. Hopefully they looked at the results and did the math to come up with the correct conclusion though before purchasing. I know I learned my lesson and won't be buying any of them in the near future. @PigBenis it says "insane live reaction", not "insane results". That being said I bet results are insane to him and most likely would be to many people, including myself. Also painy boy is known for misleading titles. One time he even said he's leaving NML when he didn't. That's just how he is, I met him once in person and even told him to his face that misleading videos titles are not good and people don't like it and that he shouldn't do it. He doesn't have bad intentions I can tell you that. I'm not hating on this video or him just to clarify. Sure the title was misleading, but to me it was misleading because of the results, which I showed were less than average with the supporting math. The video was something to do for a few minutes and it kept me entertained while I wait to watch another ad video to hopefully get more gas for Distance tomorrow. I just don't want NG to "get away with" these sub average crates time after time...who got the good ones? Not saying you did hate. It might have sounded like it but that wasn't my intention. Consider this as a small story of my experience with this person. @PigBenis I never looked at it from the math perspective. It does make sense when I think about it but as @bladgier said I was referring to me reacting to the components I get. Usually you get less components and it isn't 25% cheaper so I guess these were good results for the price you had to pay.